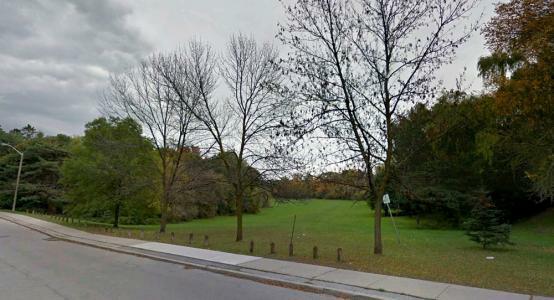 This was a creekNorth York's Glendora Park hides a dark secret beneath those green lawns, a creek buried here forty years ago. 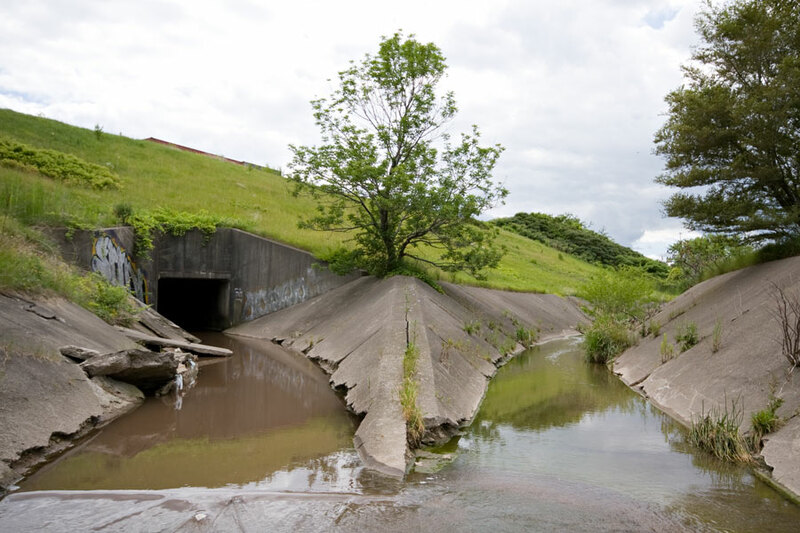 Many other GTA creeks lie buried in pipes beneath parks and other unbuilt open spaces, waiting for us to commit to bringing them back to the surface. The Lost Rivers documentary (in which I appear briefly) recently had by all accounts a very successful week-long run at the Bloor Cinema, well-received by critics and audience members alike. As many reviews have observed, Toronto is used as a critical whipping-horse in the film, a contrast to daylighting projects in London, Soeul and Yonkers NY that Lost Rivers applauds. 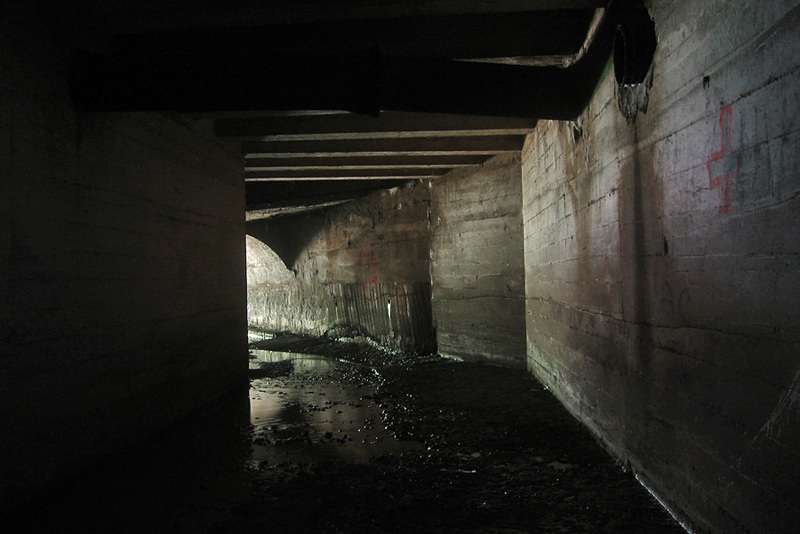 Instead of following through on a compelling 1990s plan by local architects James Brown and Kim Storey to begin treating collecting, treating and infiltrating runoff aboveground in the Garrison Creek ravine, the film reminds us that we doubled down on expensive and ineffectual underground storage (and are poised to do it again in the Don Valley). We make a habit in Toronto of failing to get out in front of emerging practices in environmental urbanism. 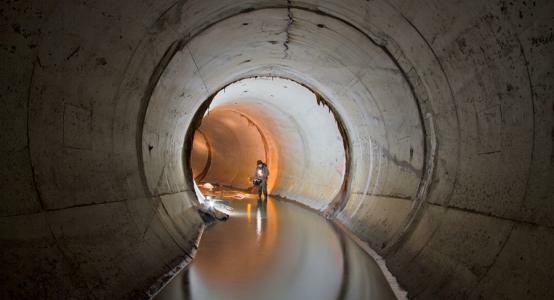 In the thirty years that elapsed after an interceptor sewer system was first proposed for Toronto, taxpayers rejected the cost of its construction three times, before finally agreeing to build it in 1908. 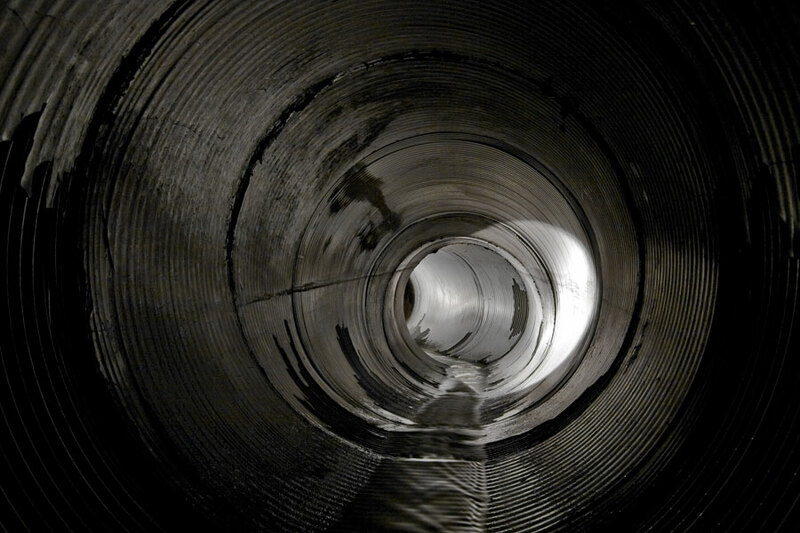 The state of the art then was to bury surface creeks and surface water in sewers, and then pipe all the cross-contaminated water as far away from the water supply as possible (and maybe do some treatment at the end). It was an approach that solved one public health problem, but created all the water quality problems that we spent a century ignoring and now have spent at least thirty years debating how to solve. And now, with the engineering and ecological know-how to restore some of the surface water system that those sewers replaced, our municipal engineers and we the residents are dragging our feet again. 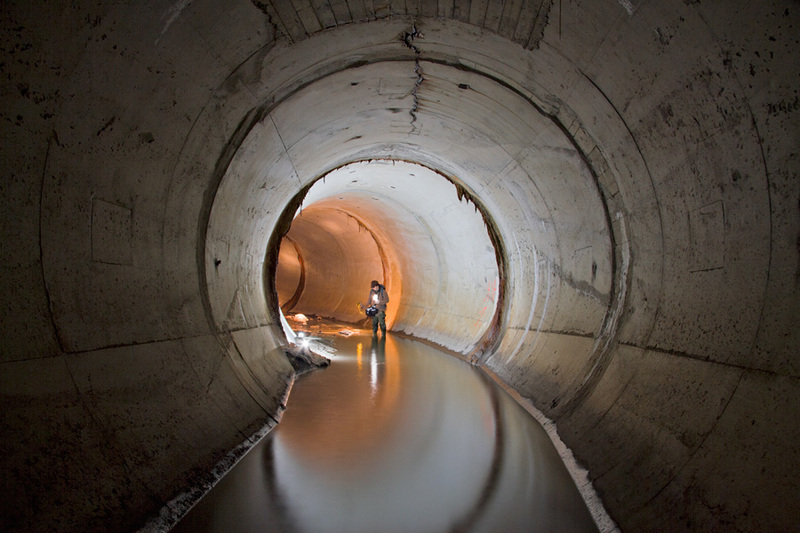 What ecologists, hydrologists, and even most civil engineers all know, is that the best and most inexpensive way of dealing with storm flows, combined sewer overflows, and a host of other issues with water quality and quantity, is to keep the water out of the hard infrastructure systems to begin with. This means diverting rainwater into wetlands and into groundwater, so that it doesn't enter a storm sewer or combined sewer and become fast-flowing, contaminated wastewater. This also needs to mean restoring creeks that we have buried in storm sewers or armoured into rapid-conveyance concrete channels. Only the pre-1950s parts of amalgamated Toronto (and Hamilton) are afflicted with combined sewers. The rest of the GTA has separated sewers, but the problems with water quality, with erosion, with lifeless and sometimes missing waterways are no less severe. In those suburbs, creeks were buried or heavily altered from the 1940s to the 1990s not to carry our household sanitary wastes, but simply to make suburban development plans easier and more profitable. In many cases, we did not even build streets and buildings on top of them, but simply left networks of barren greenways in their place. But in those embarrassing strings of dry parks we can also find our best and least disruptive opportunity to begin the process of reversing a century of watershed burial in Toronto and the surrounding region. These are places where we could begin the process of daylighting tomorrow, where we could first learn to accept water in our neighbourhoods and in our parks, where our municipal works and water departments could finally become comfortable building and managing soft infrastructure and working upstream of their hardened pipes. 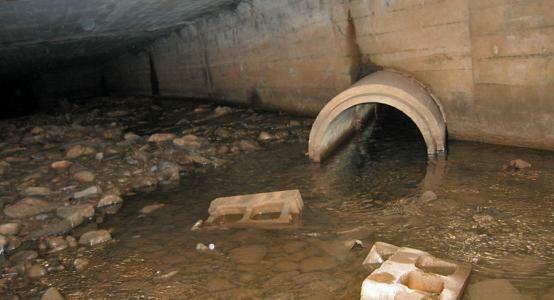 We need to go upstream and find ways to keep rainwater out of our sewer systems to begin with. We need to restore functional sequences of wet lands, groundwater infiltration and surface streams, and to do that, we need to get used to accomodating water in our neighbourhoods and our parks again. That could mean following the lead of Yonkers NY and other cities that are proving that digging up our buried waterways is a viable and even cost-effective proposition. 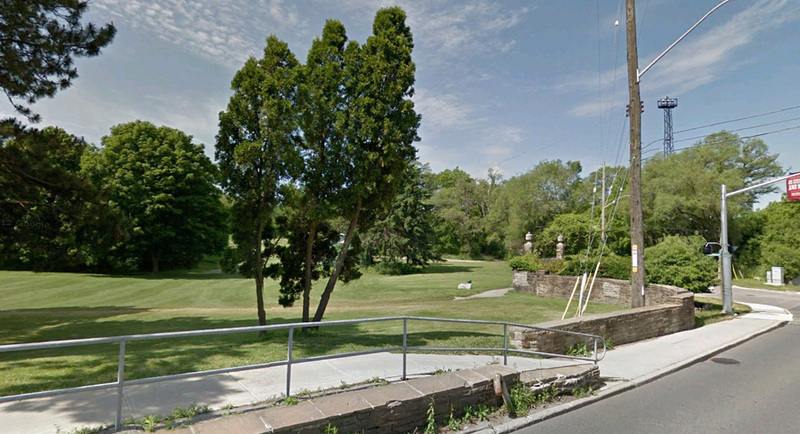 Yonkers has also shown that revitalized creeks can spur multi-billion dollar private investments in urban redevelopment, using a daylit creek in the same way that Waterfront Toronto has used signature parks on our city's central waterfront. The following 'lost' Southern Ontario creeks, all of which run for part or all of their lengths under open spaces, would be good places to start in daylighting our rainfall and in activating reinvestment in the region's older suburbs. 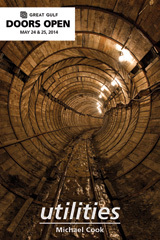 Parsons Creek was buried in an extension of the North York Storm Trunk Sewer in the 1970s. Today, its course is a 1.2 km greenway. This Black Creek tributary was buried in the 1960s and 1970s to accomodate storm flows from the northeast part of the Borough of York and from the Spadina Expressway (now Allen Road). Burying the creek also eventually facilitated the construction of the Ingram Transfer Station in the 1980s by Metropolitan Toronto, and a line of mid-rise apartment towers along Gulliver Road west of Keele Street. However, nothing was built on top of the 1.2 km of the stream between the Ingram Transfer Station and the banks of the Black Creek. The portion of the North York Storm Trunk Sewer west of Keele Street is of much poorer quality than the concrete tunnel built upstream by Metro Toronto Works, and is beginning to seriously erode. 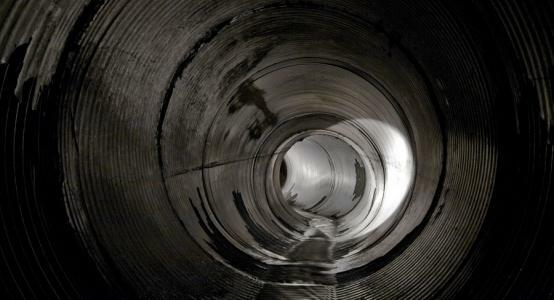 As I have witnessed in many places, the lifespan of a corrugated metal pipe, even one reinforced with a bitumen (as this one appears to have been) or polymer lining, is only a few decades, after which the fast flowing water (both corrosive and abrasive) rusts and eats and drives through the floor of the drain and undermines the earth beneath it. 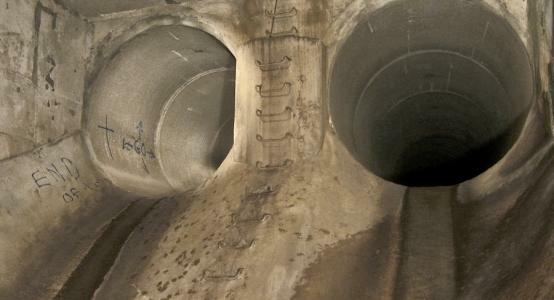 Within the next 10-15 years, Toronto Water will likely need to make major repairs to this section of the storm sewer to avoid a collapse. In the meantime, that bituminous coating that I mentioned is itself contributing to pollution within the downstream watershed. This stretch of the trunk sewer is an unquestionable negative for the community and for the Humber watershed, and it does not need to be there at all. The greenway that winds along the former course of the stream has never been formalized as a city park, and may be owned by the TRCA. It is broad enough to accomodate surface water with some form of upstream volume and velocity control. With an effective system of wetland facilities and naturalized streambed, daylighting this stream would make an important contribution to water quality and erosion control in the Black Creek itself, improvements that could make it easier to remove the concrete channel from the Black Creek's lower reach as it runs through South Weston and Symes on its way to the Humber River. Conveniently, the city owns a large property west of the Ingram Transfer Station that could be used to attenuate storm flows and make a surface stream possible in the greenway that runs from there to the Black Creek. The shape of Glen Erin Brook and other western tributaries of Sawmill Creek is still visible throughout the parks and greenways that run through Erin Mills. There is space for water here. The concrete storm sewers beneath Glen Erin Trail and other Erin Mills open spaces. This water should be on the surface. 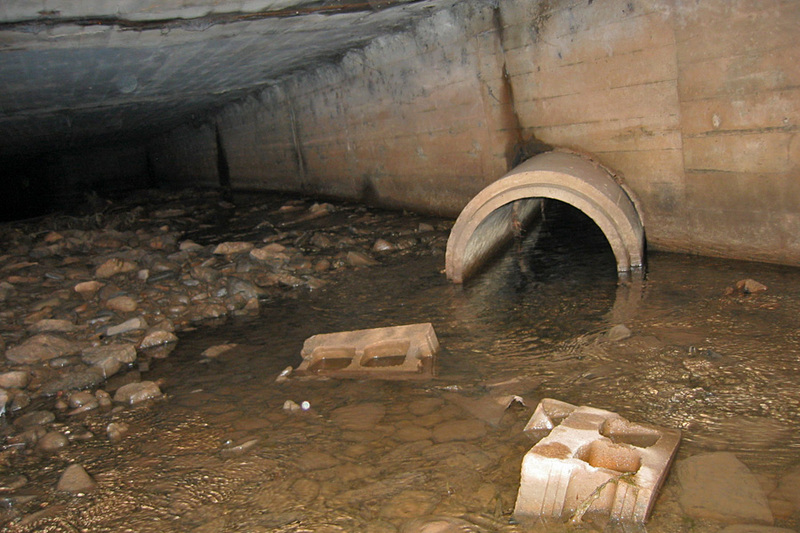 Glen Erin Brook, and various other western tributaries of Mississauga's Sawmill Creek, were put into a concrete storm sewer in the 1970s to allow the construction of the massive Erin Mills planned community. This Mississauga neighbourhood was assembled by the Don Mills Development Corporation (a historical developer that cut its teeth building Canada's first planned suburban community at Don Mills in North York). The buried creek network provided a storm sewer system for the district, while keeping the water out of sight and mind and allowing the area's single-family, semi-detached and townhomes to be built without regard for potential creek movements as a result of storms and snow melts. 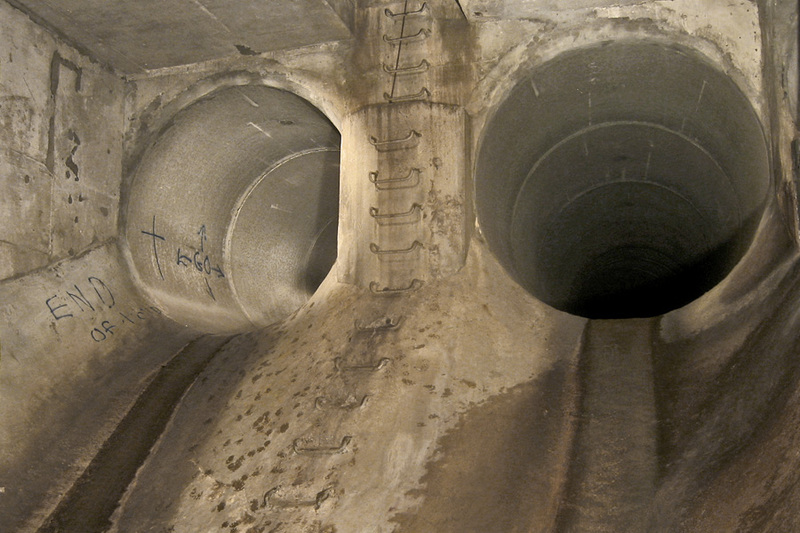 However, encasing these streams in concrete only served to increase storm velocities downstream. The lowest part of Glen Erin Brook where it is above ground, and the larger Sawmill Creek main channel that it flows into, have both been aggressively armoured since then to reduce erosion. All this concrete does nothing to slow the water coming out of Erin Mills, and makes the section of the Credit River downstream of Sawmill Creek a site of major storm damage and erosion. The shameful part is that, like the other streams profiled here, Glen Erin Brook and some of the other Sawmill tributaries do not have to be underground. The first three phases of Erin Mills were planned and built around trail systems and parks that follow the courses of these streams. 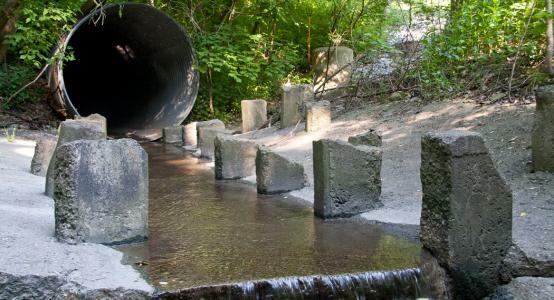 While the main Sawmill Creek was retained in its deeper ravine, the western branches were sent into concrete pipes when they reached Highway 403, forced to run beneath the tree-lined paths that wind through Erin Mills. Newer residential neighbourhoods north of the highway have since obliterated much of the headwater system, but Glen Erin Brook still rises near Highway 407 and Eglinton Avenue, running east through an agricultural field and beneath the 403 to find the inlet of this storm sewer network behind the Honeywell plant on Unity Drive. Again, there are no streets or buildings on top of this creek. The only barrier to resurrecting surface flow through the western part of Erin Mills in the form of a creek or stream is our imagination, and our willingness to accomodate water in our suburban residential open spaces. Assuming it's not too late, an effort by Credit Valley Conservation Authority and the City of Mississauga to protect that last headwater route from obliteration would also be helpful. 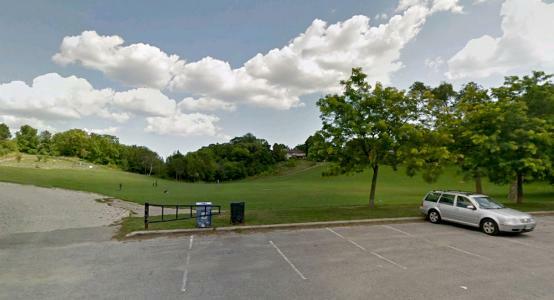 Cedarvale Park is a part of Toronto's sprawling Cedarvale and Nordheimer ravines, a landscape that was drained in the 1960s for an expressway that was never built. Covering more than 3 km on the border between the old communities of York and Forest Hill, the Cedarvale and Nordheimer ravines represent some of the more intact sections of ravine in central Toronto—intact that is except for the creek that carved them. Castle Frank Brook was buried in the 1960s into a massive, 3.75 m concrete storm sewer to accomodate the planned Spadina Expressway. The expressway was cancelled in the early 1970s, but by then the damage had been done and the water was gone. Meanwhile, York and Forest Hill got a wonderful, largely forested park system, where until recently we pretended that water never existed. 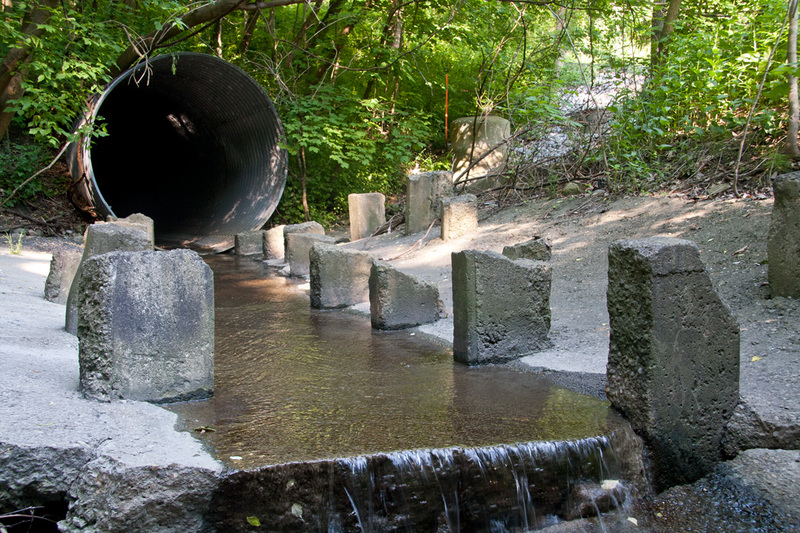 Despite the presence of that enormous trunk sewer, diverting not only stormwater but also a fair amount of groundwater from the ravine, enough still flows into the ravines (particularly in Cedarvale) through surface runoff and groundwater seeps and springs that new wetlands became established in the ravine bowl in the decades since the trunk sewer's construction. These wetlands point the way to the next step: a set of policies and engineering interventions to direct more of the area's stormwater into the ravines, rather than under them. We travel to Muskoka or Wasaga Beach or the Toronto Islands to find water to connect with, when in most of Toronto we could be finding it a 5-10 minute walk from where we live. This is certainly the case in the neighbourhoods around Cedarvale and Nordheimer, ravines where the water, in a concrete pipe, is usually only a few feet underground. 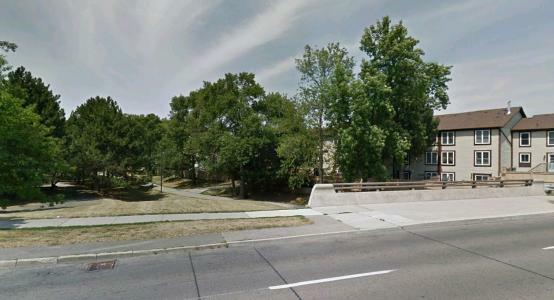 Burlington's Indian Creek disappears underground at the intersection of Plains Road and Francis Road to accommodate a few hundred metres of grassy parkway (recently rechristened a bikeway) and a playground. 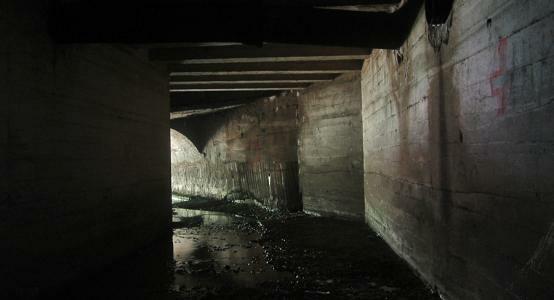 Burlington's Indian Creek is sent through several hundred meters of rectangular concrete duct, some of it with a rocky substrate, some barren concrete floor. The old course of the creek remains a greenway. 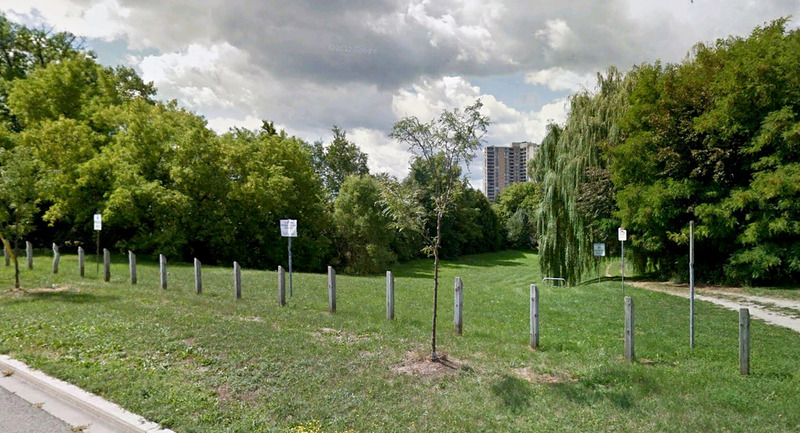 Like Parsons Creek above, Burlington's Indian Creek was buried in part to "accomodate" apartment developments built beside, rather than over top of its course, and now runs in an 800 m stretch of storm sewer either beneath a greenway or under the adjacent Francis Road. Downstream of the storm sewer, Indian Creek is a surface waterway supporting warmwater fish—including suckers and other large fish where it enters Burlington Bay. That final reach of the creek has been changed by the diversion of flows from the Hager and Rambo creek systems into the mouth of Indian via an extensive concrete canal system. However, the crucial thing is that it remains unobstructed: there are no concrete weirs or destructive lengths of pipe blocking fish movement until you get to the Indian Creek Drain. And above this drain, the creek's headwater features run down from the Niagara Escarpment to the drain inlet at Plains Road. Where restoring headwater connectivity and fish communities on most of the adjacent Hager and Rambo Creeks is impossible right now, there is only this one section of greenway drain standing in the way of Indian Creek working as a functional whole waterway again (though the Highway 403 culverts would probably bear improving too). Now, the public context of the Francis Greenway (it is currently the "front yard" of all those apartments and townhouses), means the neighbourhood would have to accept sharing space and respecting the function and needs of the creek again. But why couldn't it? The Francis area has two neighbourhood parks, two school yards, a large green cemetery ground, and is bordered by the sprawling Burlington Golf and Country Club to the west. The apartment towers and townhouse complexes adjacent to the greenway also have substantial reserves of open space that could probably be better used. 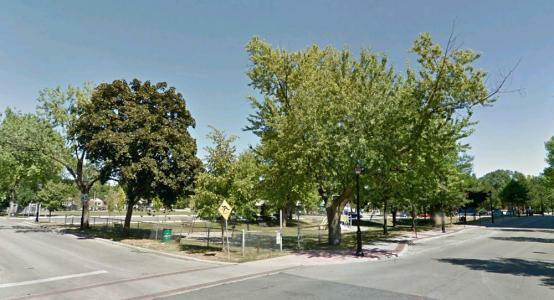 Finally, if the City of Burlington succeeds in implementing proposed streetscape improvements for Plains Road that make it a pedestrian and bike-friendly place to inhabit, the 'front' of the Francis community will shift north to this commercial artery and away from its buried creek parkway. 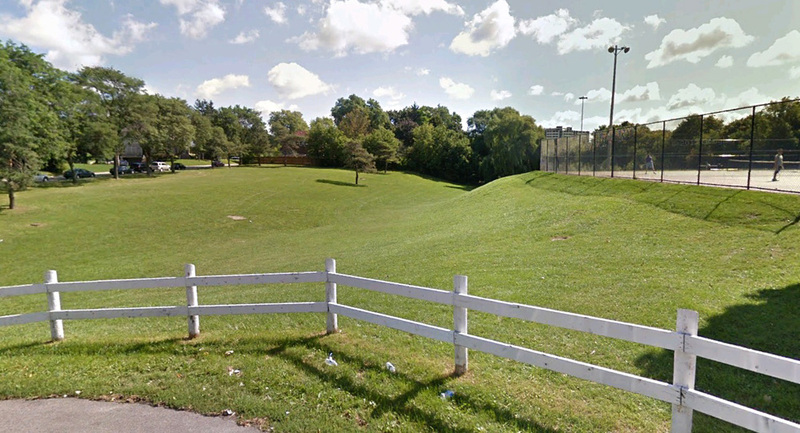 We can certainly find other places for the playground and basketball court, the question is really whether Burlington and the Francis community can find a place for Indian Creek. Saint Andrews Park, between York Mills Road and Highway 401, is the grassy remnant of Wilket Creek, buried for no good reason in the early 1970s. Much of this West Don River tributary was buried in the 1960s and 1970s, mostly at the urging of new suburban residents who rejected engineers' recommendations to reinforce but keep an open channel for the creek. 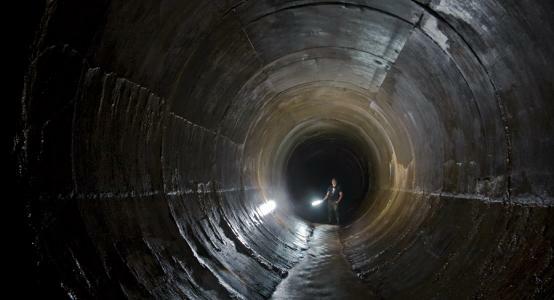 Wilket Creek now runs in an enormous storm trunk sewer, from north of Finch Avenue (at Edithvale Park) to York Mills Road at Bayview Avenue, where it emerges to flow another 4 km to its meeting with the West Don. 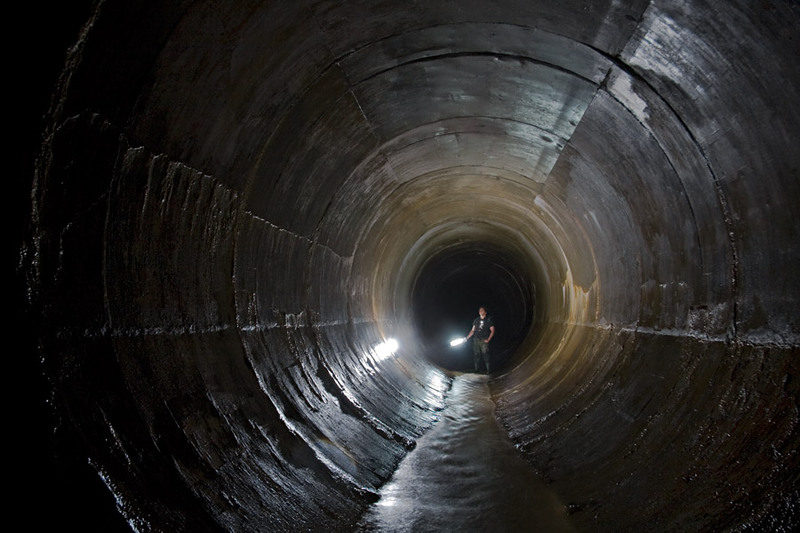 It is an incredible tunnel, sometimes as large as 5 metres in diameter, with a darkness that is periodically punctuated by large skylit grilles that drain the surface runoff still flowing across the creek's old floodplain. 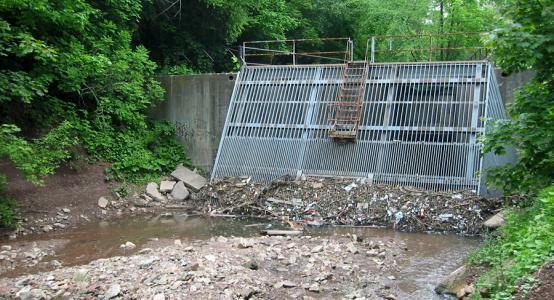 It is also a terrible waste of what could be an exceptional ecological resource between the valleys of the west and east arms of the Don, and a damaging influence on the river downstream. It is time to work on reversing that forty-year-old error. The upstream reach of the creek, from Sheppard and Yonge up to Finch and beyond, was heavily built up after its burial, though we can still find it in the positioning of apartment towers and in strangely shaped parks in the neighbourhood around the North York Civic Centre. However, save for one incongruous block of luxury homes south of Highway 401, the creek's floodplain south of Sheppard is almost entirely retained in empty green spaces—at least 3 km of creekway waiting for our ingenuity and commitment to rebuilding a functioning creek that can absorb storm flows, provide ecological benefits, and enhance the quality of life in St. Andrews and South Willowdale. An important section of Burlington's historic Rambo Creek is embarrassingly buried beneath the grounds and parking lot of the local Lions Club. Rambo Creek flows in a tunnel below the parking lot and baseball diamond of the Burlington Lions Club. Rambo Creek was an important landmark in the establishment of Burlington, the last lakefronting GTA suburb on the road west to Hamilton and Niagara Region. The mouth of the creek marked the south east corner of Brant's Block, a tract of land granted to Joseph Brant, a Mohawk military leader born in Ohio who allied with the British during the American Revolutionary War. Lots sold out of this grant by Brant and his estate opened the area to farming and to the development of Wellington Square, the central grain port not only for what became Halton County but for a time for Dundas and areas further inland as well. That centre of gravity is maintained today in downtown Burlington. Despite the extensive hardening, burial and diversion of Rambo's upstream watershed, the mouth of the creek remains a picturesque and largely hidden place. Beneath stately willows, the creek's final run into the lake is covered in freshwater mollusc shells washed in from offshore shoals and picked over by gulls. There is even a little more than 400 m of shallow, tree-covered ravine upstream of the mouth, running behind 60-160 year old homes and post-war apartment towers. But beyond this surviving fragment, the creek suffers through a series of completely unnecessary indignities in its run through Central Burlington (the northern portion of the creek, above Fairview Street, has been buried and then routed into a concrete channel that diverts the urban storm flow southwest to Indian Creek and Burlington Bay). 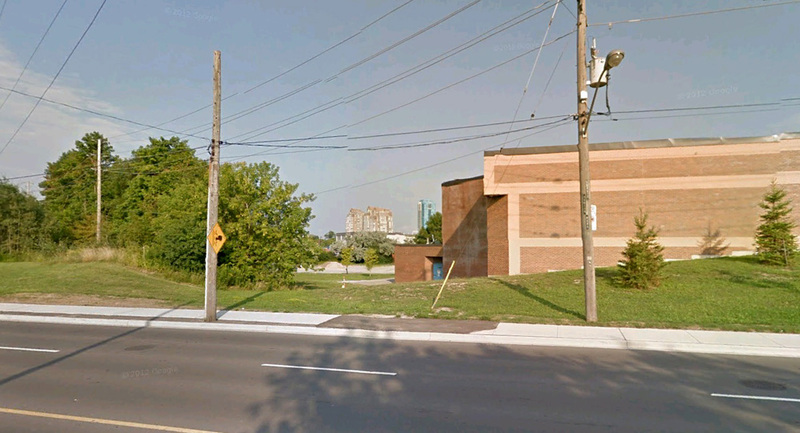 In a story we are much too familiar with here in the GTA, one section of the creek has been buried to accomodate the parking lot of a school and neighbouring Catholic church. The next section is intact, but damaged by the encroachment of the back parking and loading dock zone of the No Frills strip plaza on Brant Street between Baldwin and Caroline. 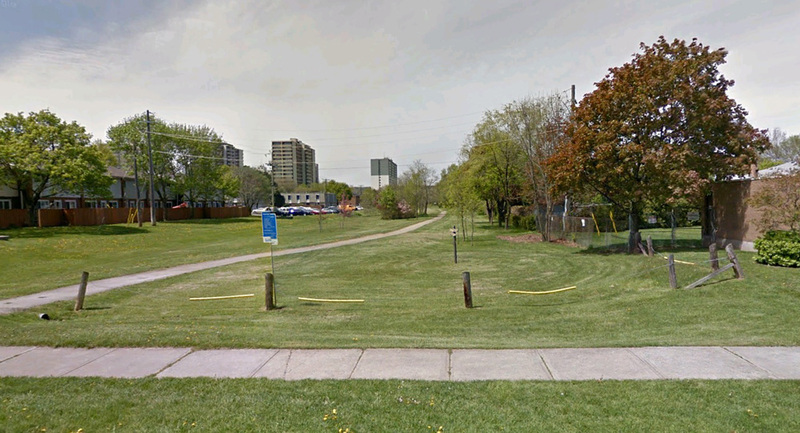 Then a final indignity: the creek is routed underground again, this time to accommodate the Burlington Lions Club headquarters and its adjacent parking lot and baseball diamond. Having a creek in a pipe, below a park, with all the local and downstream consequences that that entails, is becoming increasingly indefensible in this day and age. I would suggest that the Burlington Lions Club's commitment to local and global community service should include restoring the function of the creek on whose banks they are headquartered. We can still see where Wilson Brook flowed in the landscape around the Victoria Village Arena and the City of Toronto's Bermondsey Yards. The space is still there if we want to put the creek back. In an unseen corner between North York, East York and Scarborough, on the edge of the East Don River, parts of the Wilson Brook were buried as recently as 1991 to provide a private dumping space (for snow, garbage bins, and other temporary storage) for the city's Bermondsey Works Yard. Other parts of the creek had been buried in the 1970s, making room for a municipal signage shop and for the parking lot of the Victoria Village Arena. Parts of the creek further upstream in a hydro corridor survive on the surface, as does the final reach through deep woods in the Charles Sauriol Conservation Reserve. This creek should not be underground. That emergency snow dump ravine should be clawed back from Toronto Works, whose lack of care towards the Wilson ravine and the East Don Valley in general at Bermondsey Yard should trouble us deeply. Upstream, a hydro corridor that is already accommodating the surface creek, allotment gardens and an orchard north of Eglinton can accomodate at least the creek on the south side as well. The east side of Chedoke Civic Golf Course occupies the old course of a major branch of Chedoke Creek in Hamilton. What could be a functional reach of Chedoke Creek below the escarpment is instead routed into a very large underground diversion. Fixing Hamilton's Chedoke Creek might be the most involved of all the propositions advanced here, but a serious effort here is needed no less urgently. Modifications to Chedoke Creek began in the 1920s when a part of one arm of the creek was first routed underground for the expansion of the Chedoke Civic Golf Course as well as industrial and railway facilities north of Aberdeen Avenue. The bulk of the damage was inflicted in the 1950s and 1960s however. The Chedoke headwater streams above the escarpment were buried in storm sewers to accomodate tracts of new houses on the Mountain; it was later discovered that many of these houses had their plumbing connected directly into this storm sewer, rather than the sanitary sewer, sending toilet waste directly into the downstream creek and Cootes Paradise year-round (the City of Hamilton has finally begun to remove these connections). At the other end of the watershed, the creek's main, valley channel was straightened and reinforced with concrete to allow Highway 403 to be constructed alongside it. In between, the city built a larger diversion tunnel beneath the golf course to replace the original culvert and accomodate the larger storm flows generated by development on the Mountain. 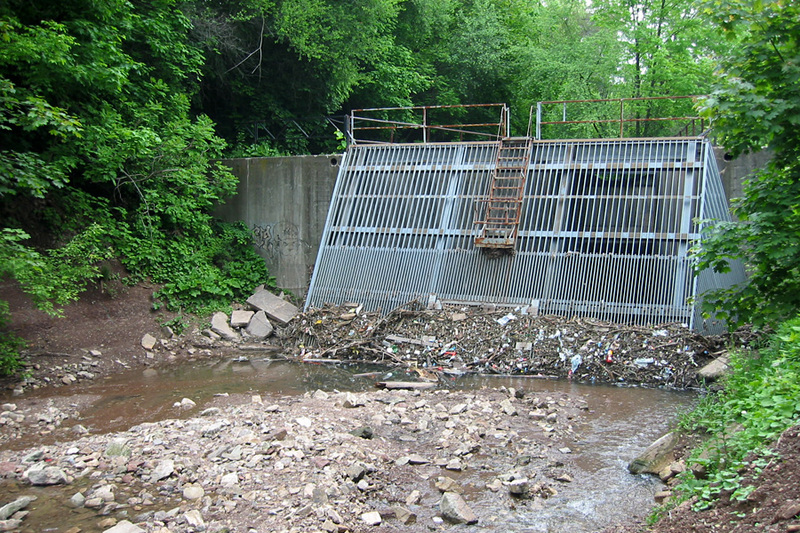 Several intentional combined sewer overflows are located along the creek, although since the 1990s Hamilton has built storage tanks to capture most of these overflows before they reach the creek. Chedoke Creek is hard infrastructure almost from headwater to lake. So why put Chedoke on this list? Readers that have visited the fragments of natural boulder creek that run down the escarpment slope from waterfall outfalls above the golf course, or that have spent time in estuary wetlands in and around Cootes Paradise, know what this creek could be. Chedoke Civic Golf Course could accomodate its waters again, while the redevelopment of the former Camco industrial property at Aberdeen and Longwood (and reduced use of the Aberdeen rail yard) presents an opportunity to work the creek back into evolving plans for the McMaster Innovation Park. The main channel along the highway is the most complicated proposition, but we could be working the golf course to absorb the storm velocities and volumes that are presently addressed by decaying concrete walls in the main channel. There will never be a natural stream beside the 403, but there could be an ecologically functional one. Already, pumpkinseed and other native fish congregate in the waters of the lowest Chedoke culvert (beneath Tope Crescent and the Main and King Street overpasses), small measures could bring beneficial plant and aquatic communities up through the rest of the channel. 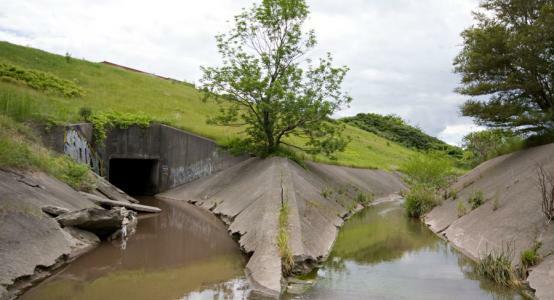 Just fifteen years ago, the City of Hamilton followed through with building an expressway on a major watershed (the Red Hill Creek, in East Hamilton / Stoney Creek), over the objections of the provincial and federal governments and many of its own residents. But times change, and Hamilton's priorities are evolving extremely quickly. People are reinvesting in and moving back into Hamilton's core, and the city is working through a proposal to install a new light rail transit line (the city's transit system still calls itself the Hamilton Street Railway, decades after the last streetcar plied its streets). Along with these other signs of progress, a commitment to restoring the highway- and tunnel-impaired Chedoke Creek would represent an incredible and achievable signal that this industrial community is serious about recovering its future.